"Can you see…? You inspire the people!" Lionsgate has debuted one final official trailer for their new Robin Hood movie. The final trailer is just as worrisome as the last trailer, even though it looks like it has some entertaining action. They're definitely trying to sell this like Pirates of the Caribbean, about a man of the people, and I don't think it's going to work. This new Robin Hood stars England's top young actor Taron Egerton as Robin of Loxley, a "war-hardened Crusader" who fights against the corrupt English crown with his friend, Little John, played by Jamie Foxx. The cast includes Ben Mendelsohn, Eve Hewson, Tim Minchin, Björn Bengtsson, Ian Peck, and Jamie Dornan. As much as I'd like to see a modern Robin Hood movie, this just looks like every other action movie in the last decade. Give me something else, please. You can watch the teaser trailer for Otto Bathurst's Robin Hood here, or the second official trailer here. Robin of Loxley (Taron Egerton) a war-hardened Crusader and his Moorish commander (Jamie Foxx) mount an audacious revolt against the corrupt English crown in a thrilling action-adventure packed with gritty battlefield exploits, mind-blowing fight choreography, and a timeless romance. 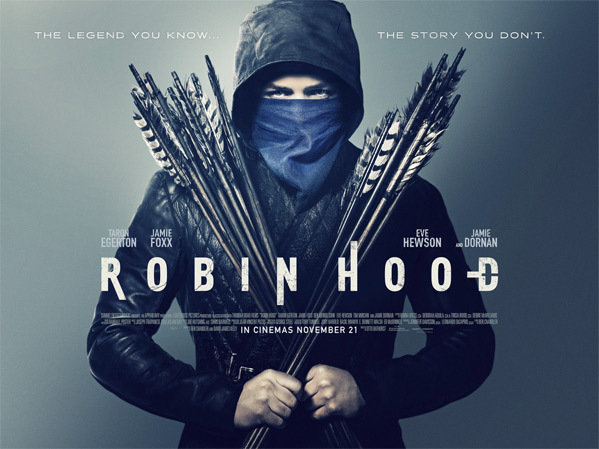 Robin Hood is directed by English filmmaker Otto Bathurst, a veteran TV director (episodes of "Peaky Blinders", "Black Mirror", "Criminal Justice", "Hustle", "UGetMe") making his feature film directorial debut with this. The screenplay is written by Ben Chandler and David James Kelly. Lionsgate will release Bathurst's latest Robin Hood movie in theaters everywhere starting November 21st later this fall. Anyone planning to go see this?